When you got a new computer or going to reinstall your current OS you may want to keep your Outlook contacts. Here is the way you can export Outlook address book to another PC or operating system. A need to export Outlook contacts appears when you just got a new computer and want to move Outlook address book to it. Also you may want to use another application instead of Outlook or you're simply moving to webmail service. So let's see what we can do. 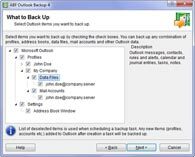 Using Outlook Backup program you'll be able to move your contacts to another Outlook easily. Run the program and backup the Data Files. Then move the backup file to the second PC, run Outlook Backup and restore from this file. The program also enables you to export in this way Outlook messages, options and settings, signatures and other important data. See Outlook Backup features for details. Sometimes you may need to export your Outlook contacts to another application or webmail service (like Gmail for example). In this case you should export Outlook address book as a Comma Separated Values. You can do this in the following way: run Outlook, go to File > Import and Export > Comma Separated Values (Windows) and click Next. In the appeared folders list select Contacts folder and click Next. Select where to put the resulting CSV file and choose file name. Click Next and then Finish. Now you can import your contacts from this file anytime you like. How to export Outlook files and setting using Outlook Backup. Handy program to backup Outlook. Transfer Outlook - quick guide. How to back up Outlook fast and easily.